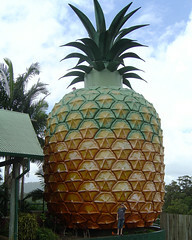 This wonderful landmark is apparently in Queensland, Australia. My wife and I were married in Newport, RI. The symbol of that town is the pineapple and we have several pineapple themed decorations throughout our home. Pineapples have become very special to me. This place will be immediately placed on my “things to see/do in my lifetime” list. WOW!! That’s worth a trip to Australia to see.